Harith Lim soft tip darts with a gold coating. It comes with a Harith Lim design Dartslive card. Limited in quantity! The first signature flights of Cali West who plays an important role on the US darts scene. Standard shape of Fit Flight and Fit Flight AIR are available. The second signature flights of Darren Webster who competes on the PDC circuit. Fit Flight Standard and Fit Flight Shape are available. The first Juggler Skeleton was an immediate sellout, but the Skeleton design is back! Juggler Skeleton 2 is now available in different flight colors. The cute and colorful Navajo pattern is available in two color options, Red and Yellow. 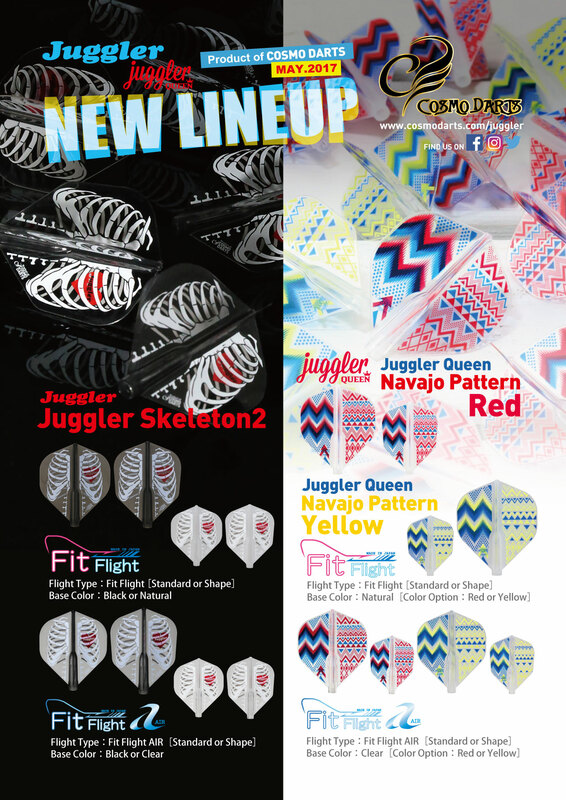 Both Skeleton 2 and Navajo Pattern are available in Fit Flight and Fit Flight AIR. The above products are available for sale from May 25th, 2017.